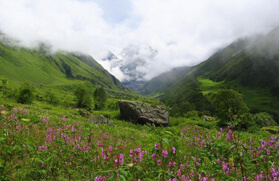 The Valley of Flowers is a beautiful meadow located at an altitude of about eleven thousand feet. 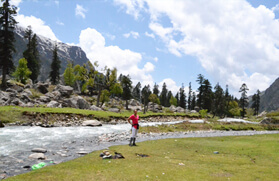 It is the valley of the stream Pushpavati, a tributary of Alaknanda. Frank Smythe discovered 'The Valley of Flowers' in 1931 on his way back after a successful expedition to Mt. Kamet. Ferns, dwarf iris, dwarf larkspur, dwarf rhododendrons, primula, blue poppies, fritillaria, asters, potentillas, inula grandifloras and hundreds of other species grow wild in the valley. The Valley of Flowers is a riot of color in August/September. Well over a thousand varieties of flowers, shrubs, orchids and plants in myriad hues, differing textures and colors paint the valley in a gorgeous display. 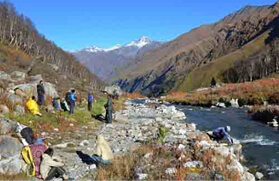 The valley is a natural plantation surrounded by the dazzling snow clad Himalayas, a feast for the botanist and amateur alike. Legends associate this valley of Garhwal Himalayas with the area from where lord Hanuman collected "Sanjeevani" herbs to revive Lakshmana, the younger brother of lord Rama. Hanumanji had to visit far-flung areas in his search for the "Sanjeevani" life - saving herbs. In 1939, Miss Margaret Legge, a botanist deputed by the botanical gardens of Edinburgh arrived at the valley of flowers for further studies, While she slipped off and was lost for ever in the garden of the gods. Her sister later visited the valley of flowers and erected a memorial on the spot where she was buried by the locals. The thoughtful memorial is still there. Board Dehradun Nizamuddin AC Special train for Haridwar at 23:30 hrs from Nizamuddin railway station. Overnight journey. Arrival at Haridwar by early in the morning at 04:00 hrs. Upon arrival at Haridwar transfer to Ukhimath via Rishikesh, Devprayag (Confluence of Alaknanda & Bhagirathi, from Devprayag the Holy river Ganges started), Rudraprayag (Confluence of Alaknanda & Mandakini River).Breakfast and lunch enroute. Arrival at Ukhimath by evening. Check into TRH. Dinner and overnight stay. Ukhimath (1370 mts/4500 ft) is on the other side of the Mandakini River Valley from Guptkashi a relatively short steep walk by foot, or a much longer way by road. 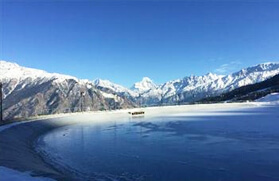 Ukhimath is the winter seat of Kedarnath, as well as the winter home of the priest who presides over his worship. After the Kedarnath temple closes for the winter, a movable image of Kedarnath is brought in procession to Ukhimath, where it resides until the Kedarnath temple reopens in late April or early May. The outer gateway to the temple complex is not only brightly painted and decorated, but two full stories tall (the wall also serves as the back wall of buildings inside). The stones piled at lower left were for some sort of construction project, which was in full swing when I visited (since summer is the "slow" season ritually speaking, it made sense for the place to be torn up them. And the nearby buildings are clearly residential, since a young girl is visible at upper right. In the morning you can see snow clapped Himalayan ranges. After breakfast start your trek to Deoriatal through dense forest of Rhodendron and lots of wild flowers and ferns. The trek will take 3- 4 hrs to reach Deoriatal. Upon arrival at Deoriatal set out the tents for overnight stay. 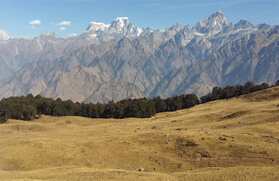 In the morning trek down to Sari village (3 kms) and from here drive to Chopta through dense forest and meadows. Its 30 kms drive from Sari Village. 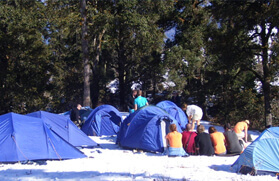 Upon arrival at Chopta set out your tents for overnight stay. In the evening explore the magnificent view of the Himalayas. 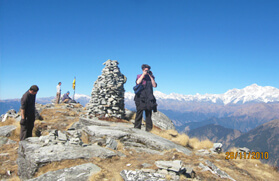 Chandrasila (4090 mts/13415 ft) - Chopta After an early breakfast trek to Tungnath with packed lunch. 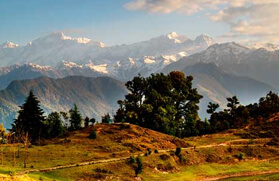 Tungnath is situated at the height of 3680 mts from the sea level the highest in India. 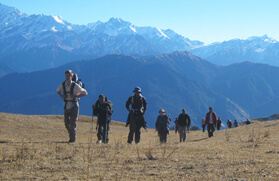 The trek is three kms upward. 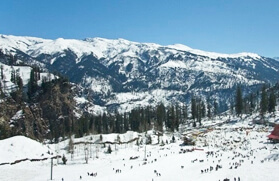 Enroute you will find lush green meadows and you can see the entire range of snow clapped Himalayas. Upon arrival at Tungnath Temple and visit the temple. After relax one further one kms trek to Chandrasila peak. 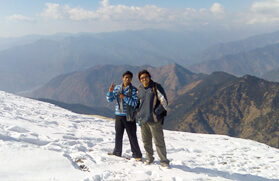 Later trek back to Chopta for dinner and overnight stay. After an early breakfast drive to Haridwar. Breakfast & Lunch enroute. Upon arrival at Haridwar transfer to railway station to catch Dehradun Shatabdi express train for Delhi at 18:05 hrs. Arrival at Delhi by 22:45 hrs. Trip and services ends here Rhodendhron and lots of wild flowers and ferns. 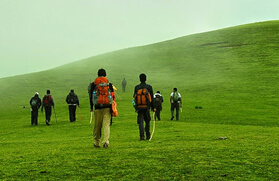 The trek will take 3- 4 hrs to reach Deoriatal. Upon arrival at Deoriatal set out the tents for overnight stay.